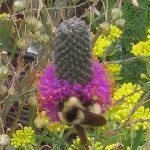 Yellow Bee Plant is a smaller cousin of the purple Rocky Mountain Bee plant, Both of these annuals are extremely valuable as food sources for native bees and butterflies as well as honeybees. Very long-blooming and freely reseeding in the garden. Available spring only. Native to: Idaho and most of the Western U.S. This outstanding native annual is a magnet for honey bees and native bees alike! Tall stalks end in multiple flowers that look as if they were designed by Dr. Seuss. 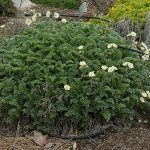 Once it starts blooming in early to mid-summer, Rocky Mountain Bee Plant just keeps going until fall. More information here. 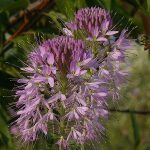 Height x Width: 18" x 18"
Purple Prairie Clover produces lovely purple bottle-brushes on erect stems. 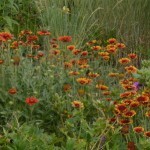 Perfect specimen plant or as part of a meadow or prairie planting. Long-lived, with a deep taproot. Often found on eroded, depleted soils, including caliche. Supports bees and butterflies and fixes nitrogen. Height x Width: 12 inches x 1-3 feet wide. Sand Pink forms large hummocks packed with narrow evergreen foliage. 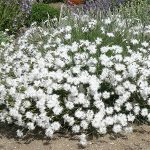 In late spring it is covered with extremely fragrant little white flowers like snowflakes. Attracts butterflies. Height x Width: 6 in. x 10 in. 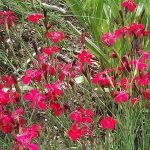 ‘Flashing Lights’ Dianthus (Pink): This evergreen dianthus is not pink, but a deep, brilliant red. The mound of narrow, dark green, grassy leaves is attractive year-round. Great for low edging at the front edge of a bed or in a rock garden. Attracts butterflies. Height x Width: 8 in. x 18 in. ‘Firewitch’ Dianthus (Pink) is a bouquet of electric magenta flowers with frilly edges over a mound of attractive gray-green foliage. 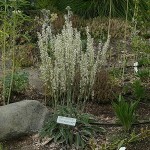 Excellent rock garden plant, or use at the front of a border. Attracts butterflies. 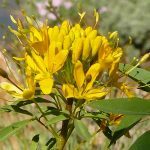 This tap-rooted perennial is found in open, dry prairies of the Midwest, and is prized for its medicinal value. 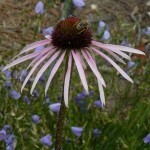 It is also highly ornamental, with lovely purple coneflowers floating above narrow-leaved stalks. Good nectar plant for butterflies and bees. Height x Width: 24 in. x 18 in. Thin purple petals of this Conflower drape delicately from a bold brown center. 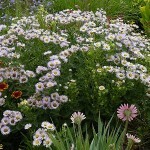 It is lovely in a bouquet and also great for naturalizing en masse in the garden. Its deep taproot allows it to thrive in dry soils. Nectar plant for Monarch and other butterflies. Tolerates clay. Pollinators: bees, butterflies. 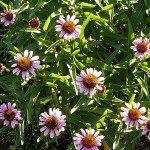 Height x Width: 30" x 15"
This is the only Coneflower with yellow rather than purple flowers. Its drooping yellow petals surround large, coppery-brown cones. Nectar plant for Monarch and other butterflies. Tolerates clay. Height x Width: 2 ft. x 1 ft. 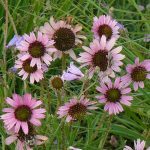 Shorter than other Echinaceas, Tennessee Coneflower cheerfully faces the rising sun and blooms like crazy–even despite heat and low water. 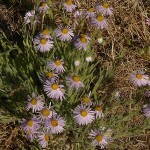 Native to dry, rocky areas in Tennessee, it does well in the Intermountain West. Height x Width: 4 in. x 12 in. 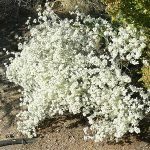 This is the prostrate form of the native Mormon Tea shrub. 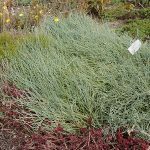 Thin stems intertwine on the ground to gradually form a thick, sprawling, evergreen groundcover. In mid-summer dozens of bright red berry-like flowers appear, nestled down in the foliage. From Tibet, rare. The red tubular flowers are a magnet for Hummers in the late summer and early autumn, as these tiny birds prepare for their annual migration. Adaptable to many soil types and low water, Hummingbird Trumpet provides a spectacular splash of color in the late season garden. This is a miniature European version of our beautiful native Fireweed. 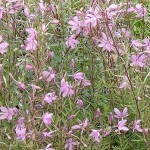 We have been reluctant to offer Fireweed itself as it can be very invasive. Alpine Willowherb is much smaller and promises to be better behaved in the garden. Supports honeybees. Height x Width: 6 in. x 6 in. 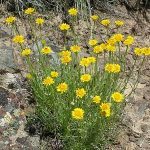 Desert Yellow Fleabane is a small native daisy with cheerful yellow flowers in summer. Grows in poor soil with little care. 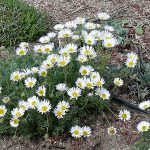 Height x Width: 8" x 8"
Cheerful little Shaggy Fleabane (Shaggy Daisy) is native to the Boise Foothills. 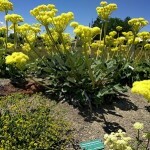 It will survive without additional water, but will flower much more vigorously if given a bit of extra moisture. Height x Width: 24 in. x 12 in. Showy Fleabane is an erect native Daisy (or Fleabane) with narrow leaves and cheerful purple that flowers in early to mid-summer. Usually occurs in woodland openings or edges. Attracts native bees and butterflies. 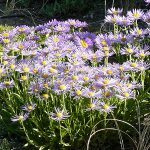 Rocky Mountain Daisy is a freely flowering purple daisy that brightens up the mid-summer garden. 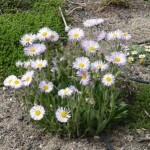 It is similar to Showy Fleabane (Erigeron speciosus) but is taller and blooms a bit later. Supports bees and butterflies. 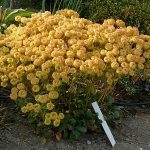 Height x Width: 3" x 12"
A beautiful mat-forming buckwheat topped with delicate round flowers–pale yellow, fading to pink or orange. 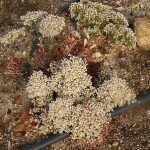 Excellent rock garden plants. Choice! The largest of our Buckwheats, Lacy Buckwheat is an amazing fall bloomer. 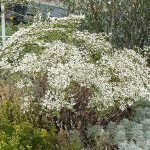 It forms large domes of finely divided woody branches that are covered with tiny white flowers Sep-Oct. Stunning! Supports honeybees and native bees. Prefers sandy/gravely soils and will tolerate poor soils. More information here. Height x Width: 5-6 in. x 20 in. 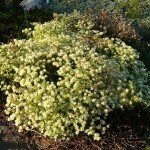 This Buckwheat forms large, dense mats covered with cream-colored to yellow flowers. It blooms during the heat of mid-summer when many other Buckwheats are done. 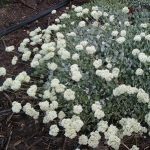 Height x Width: 8" x 12-24"
This Buckwheat features white pom-pom like flowers over expanding tuffets on tight gray-green leaves. Choice! 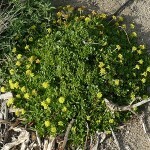 Despite the name this Buckwheat produces loads of tiny yellow flowers in our garden. 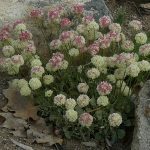 Native to dry grasslands and rocky areas, it is perfect for Rock Gardens. Great for late summer, early fall color. 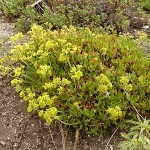 Height x Width: 16" x 10"
Height x Width: 3" x 10"
This beautiful little plant appears to be a variety of Sulfur Buckwheat. Its sculpted leaves and diminutive shrubby form make it an outstanding rock garden plant. Blooms earlier than our regular Sulfur Buckwheat. Height x Width: 18 in. x 24 in. Strict Buckwheat has gorgeous sprays of pinkish-white flowers that glow in the late summer/early autumn garden. Late season nectar source for honeybees. Boise foothills native. Height x Width: 18" x 24"
This beautiful form of Strict Buckwheat was found in Leslie Gulch, E. Oregon. 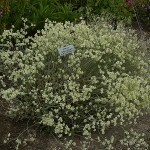 It blooms in mid-summer with a big spray of tiny white flowers over and attractive mound of sage green basal leaves. 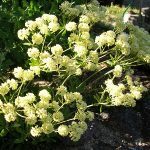 Height x Width: 12" x 18"
Sulfur Buckwheat is arguably the best all-around landscape plant native to S. Idaho. 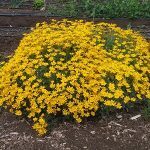 Bright yellow flower heads rise over a mat of spoon-shaped leaves and mature into a lovely copper color over the course of the summer. The basal leaves turn reddish-green in the fall and are attractive all winter long. Boise foothills native. Pollinators: butterflies, bees. Height x Width: H4 in. x W12 in. 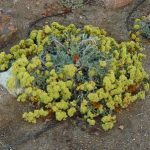 A very hardy species from mountain ridges in Utah, this plant is neat and compact with wavy, shining green leaves on short, woody stems. Umbels of flowers are at first yellow, maturing to rich reds. Not currently available. Height x Width: 3 in. x 6 in. Woolly Sunflower, also called “Oregon Sunshine” (in Oregon! 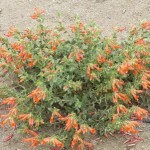 ), is one of the real standouts among native Idaho flowering plants. Relatively abundant but usually small in the wild, Woolly Sunflower grows to impressive size in the garden with a bit of extra water. It puts on a beautiful flush of yellow daisies in the late spring; foliage is semi-evergreen and handsome otherwise. Height x Width: 12in. x 18in. Yellow Stork’s Bill grows into long-lived, beautiful mounds of graceful foliage that are nearly evergreen. 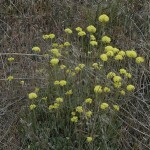 Delicate pale yellow flowers pop up in the early summer. Doesn’t mind heat and lean soil. Height x Width: 2 ft. x 18 in. 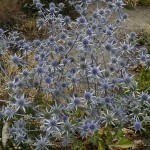 Amethyst Sea Holly has leathery, blue-green leaves with medium-tall stems bearing striking thistle-like, steel-blue flowers and matching bracts. The flowers appear in mid summer and remain effective until fall. An eye-catching garden accent! 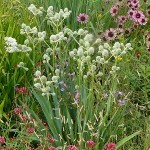 Rattlesnake Master is a tall, striking accent plant with stiff, yucca-like foliage and 1” white thistle-like flowers. Name derives from traditional belief that root will cure snake bite. Native to midwestern prairies. Pollinators: bees, beetles and flies. Height x Width: 1-2 ft. x 1-2 ft. Cheerful red flowers with yellow tips. Adaptable and reliable, this native wildflower blooms for most or all of the summer. Give haircut to in mid-summer to promote more flowering. Will seed out without being invasive. Tolerates a wide variety of soil types. Pollinators: native bees, honey bees. More information here.